New listing! 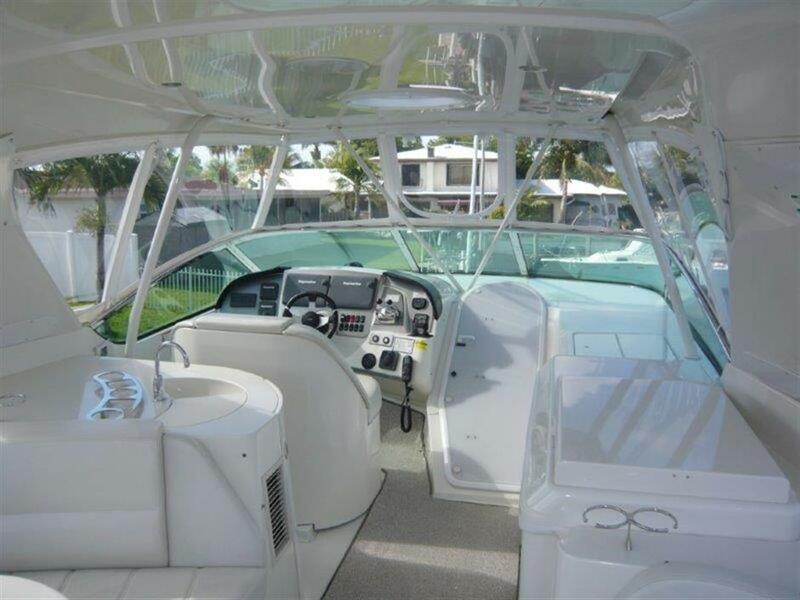 56' Carver 2007 a turn key vessel in incredible condition! : Atlantic Yacht & Ship, Inc. Originally built for the Toronto Boat Show, the 56′ Carver 2007 has every conceivable option. Owned by a knowledgeable yachtsman who went by an open checkbook policy. A fantastic opportunity to own a low hour vessel that spent most of her life in freshwater. Every option you want including hydraulic swim platform, bow and stern thrusters, handheld yacht controller and new upgraded electronics. As well as, watermaker, new tender and over $30,000 in spare parts inventory. In fact, she truly is a turn key vessel in incredible condition. The vessel is easily boarded by the midship boarding gate or wide gunwal cockpit deck. In addition, a tide ride ladder provides sure footing. From the water, by tender, the hydraulic platform makes launching and retrieval of tender and kayaks a breeze. From the swim platform, captain and crew can pass through the large transom door to the roomy cockpit. Features include large aft bench seat, teak pedestal table, ice maker, stereo remote, and quick access to the engine room. Non-skid side decks with stainless steel handrails allow for safe passage to the forward deck. Additionally, highlights include huge sun pad, Maxwell 3500 anchor windlass, in deck storage lockers and two sea kayaks on custom brackets. The flybridge has access from the pilothouse staircase or the cockpit aft deck ladder. The captain and crew will enjoy an unobstructed 360° view of their voyage. A full complements of electronics and mechanical controls provide the captain with a wealth of information for a safe passage. 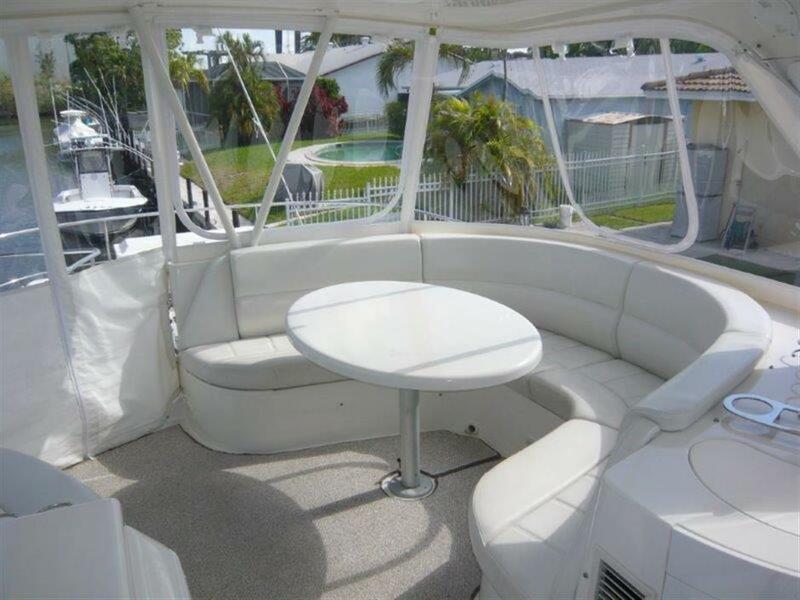 Some appointments include adjustable captains bench seat, full wet bar with refrigerator, GenAir grill, and sink. Furthermore, there is a large U-shaped settee with pedestal table and a 2nd bench seat across. The aft bridge deck has a dunnage box, life raft and a ladder down to the cockpit. The new eisenglass enclosure together with a large capacity air conditioning provides comfort on the hottest day. For more information about the 56′ Carver 2007 “Knots Tide III,” please contact the Atlantic Yacht & Ship Sales Professional Gregg Silver at 305-304-4574. 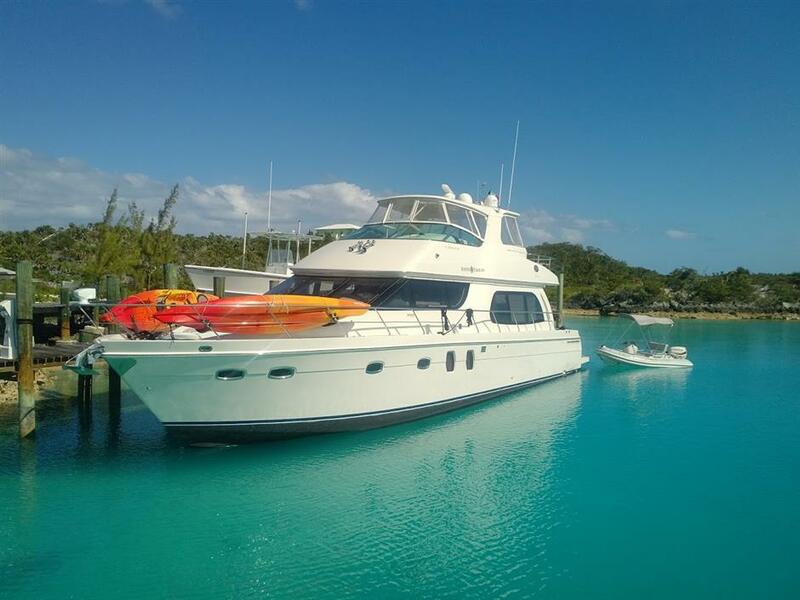 Check out this deal on a 56′ Carver Voyager Yacht!